← Mailbag Monday: Potential trades, defensive miscues and is this the real Rangers? When the Rangers (18-9-4) take on the Edmonton Oilers (14-15-2) at Madison Square Garden, one of the Rangers top defensive prospects will be making his NHL debut. 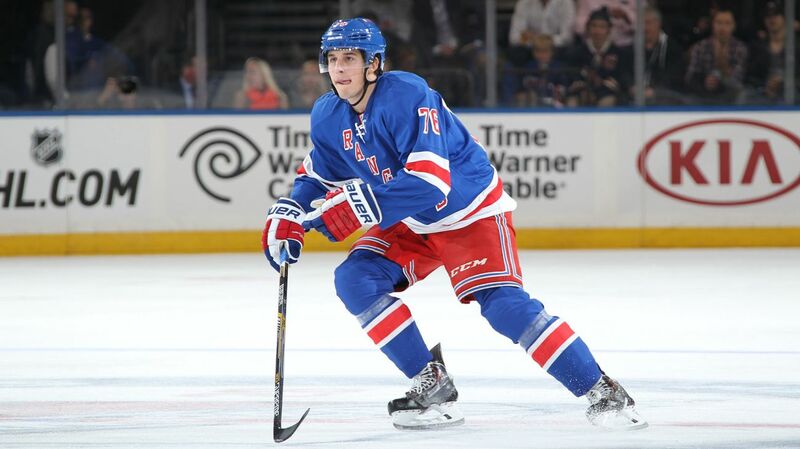 With Dan Girardi sidelined with swelling in his knee, the Ranger will start Brady Skjei, the 21 year old defenseman out of the University of Minnesota. Skjei, pronounced “shay,” debuted with the Wolf Pack at the end of last season, eventually playing on the top pairing in the playoffs. He leads Hartford defensemen with 11 points (2-9-11) in 29 games, and has nine points (2-7-9) in the last 18 games. Skjei looked to be NHL ready right out of college, an excellent skater who has always been a shut-down type of defenseman. He has shown some offensive skills, but never blew anyone away with point production. However, he’s a good passer and his transitional skills out of the defensive zone is a big part of his game. Skjei plays on the left side, so Ryan McDonagh will shift over to the right side, a position he played with team USA. Marc Staal will be paired with McDonagh on the top pairing, and Skjei, Yandle, Boyle and McIlrath will be shifted around. Brady Skjei will make his NHL debut tonight. Photo courtesy of MSG Photos. To make room for the rookie, the Rangers placed Jarret Stoll on waivers. AV stated that there simply wasn’t enough room for both of them under the salary cap. Stoll was claimed by the Minnesota Wild. Tonight’s game is the second and final matchup between the Rangers and Oilers this season. The two teams played just four nights ago, and it was the worst game the Rangers played all season. New York lost 7-5, Henrik Lundqvist was yanked and Dan Girardi and Ryan McDonagh played the worst game of their Rangers career. It was a night to forget. Edmonton won their sixth straight game last night, taking down the Boston Bruins in overtime. Jordan Eberle and Ryan Nugent-Hopkins scored in regulation, with Andrej Sekera scoring the OT winner. Cam Talbot picked up his first win since late October with a spectacular 47 save performance. That means that Anders Nilsson will almost definitely get the start tonight. Nilsson stole the starting job away from Talbot, and has posted a 10-7-1 record with a 2.65 GAA and a .917 save percentage. The Oilers have some amazing offensive talent, and it makes them a frightening team to face. Taylor Hall had a field day against the Rangers in the last game, scoring two goals, including the game winner, and tallying two assists. He already has 34 points (14-20-34) this season. Former Ranger Lauri Korpikoski scored a hat trick last Friday, rookie defenseman Darnell Nurse scored his second career goal, and Leon Draisaitl tallied four assists. The Edmonton offense exploded and the Rangers defense had no answer. Henrik Lundqvist will be back in net for the Rangers tonight, playing for the first time since his five goals against performance against the Oilers. That game wasn’t on him, the defensive coverage in front of him was the worst I have ever seen. Lundqvist will be searching for his 15th win of the season. Despite the losses, a positive to take from the last two games is that the offensive production is on the upswing. Mats Zuccarello has a goal in each of the last two games, breaking out of his mini slump. Zuccarello was pissed off after the loss to the Flames, and I think he’s going to be really motivated for tonight’s game. Dan Boyle has been really, really good lately. Since Kevin Klein’s injury, the veteran has played every game and has handled tough assignments well. He also has goals in the last two games, and his offensive game is coming together. Now that Stoll is gone (claimed by Minnesota), the Rangers fourth line can be good again! Stoll didn’t drive possession and didn’t contribute offensively, and the line of Glass-Moore-Etem has been so much better. Glass scored against the Flames, and I think this line will be important again tonight. 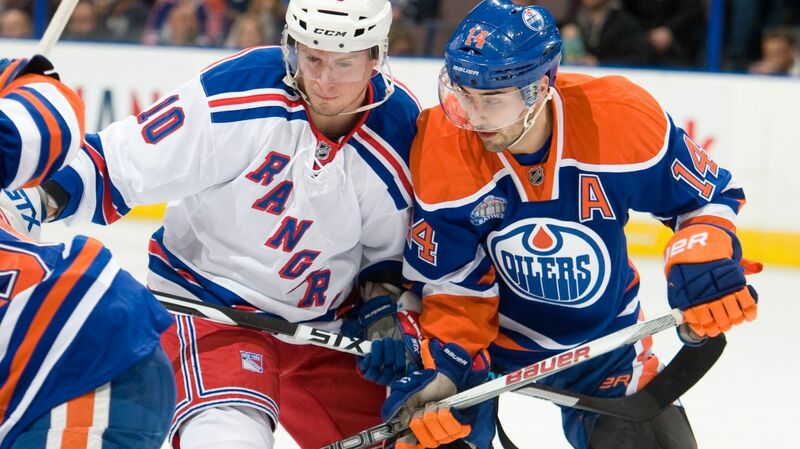 The Rangers and the Oilers will face off at Madison Square Garden at 7 PM. The game will be broadcasted on MSG Network. Posted on December 15, 2015, in Game Previews and tagged Alain Vigneault, Antti Raanta, Brady Skjei, Cam Talbot, Chris Kreider, Connor McDavid, Dan Boyle, Dan Girardi, Derick Brassard, Derick Stepan, Dominic Moore, Dylan McIlrath, Eberle, Edmonton Oilers, Emerson Etem, Henrik Lundqvist, Jarret Stoll, Jesper Fast, JT Miller, Keith Yandle, Kevin Hayes, Kevin Klein, Madison Square Garden, Marc Staal, Mats Zuccarello, MSG, New York Rangers, New York Rangers blog, NYR, Oscar Lindberg, Rangers, Rangers blog, Rick Nash, RNH, Ryan McDonagh, Skjei Minnesota, Skjei NHL debut, Stepan injury, Taylor Hall, Viktor Stalberg. Bookmark the permalink. Leave a comment.